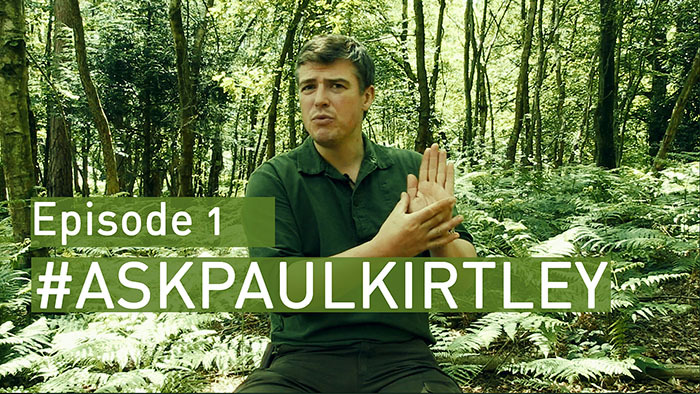 #AskPaulKirtley is my brand new Q&A video and podcast series that aims to answer your questions about bushcraft, survival skills and outdoor life. You can also watch this video on my YouTube channel. But remember if you want to ask a question for a future episode, don’t do this in the comments below, DO IT LIKE IT SAYS HERE. Just really wanted to comment and thank you for all your endeavours with bringing bushcraft and the outdoors , indoors. I really appreciate the wealth of information you provide and the time and effort you put into making this stuff available. Thanks also for your kind words regarding the information I put out. I really do appreciate it when people recognise the effort involved but, more than that, I appreciate it when people find it useful as you clearly do. great format, looking forward to more questions and answers. I’m sure I’ll be sending a few more your way! I really enjoyed this first episode and I’m looking forward to many more to come! Thanks for what you’re doing and for putting so much effort into it! You really help a lot of people – certainly you helped me! It’s good to hear from you. Thanks for your thoughts on this new format. It’s good to know it works for you. Thanks also for your kind words of appreciation. I’m very glad to have been a help to you. Thanks Reini. I’m glad you like the concept. Hi Paul, just been watching the first part of #AskPaulKirtly. I found it most interesting and look forward to many more, I too may ask you a few questions of my own at some stage. I really appreciate the amount of hard work you put in to everything you do online, and look forward to your blogs and youtube video’s with keen interest. I think you were one of the first people I watched when I first started bushcraft about two and a half years ago, and since then you have taught me so much. Thank you so much Paul for sharing your knowledge with me. Thanks for your feedback on the first episode. Please feel free to submit some questions as and when you think I might be able to help. Thanks also for your feedback on the general usefulness of my content. I’m happy it’s been so helpful to you. Thank you for the broadcast. Elegant, efficient, and useful way to teach. Some day, can you talk about specific kinds of rope used in the outdoors? Did you have some specific applications in mind? This is a fabulous idea, both a video and a soundtrack podcast. That is smart but I do not know anyone else who is offering both. Plus the idea to answer common email questions this way is also great. Keep up the great work. Thanks Rodney. I’m pleased you appreciate the different formats. Which one do you prefer? Or does it depend on what you are up to (e.g. listening on the move vs watching at home)? 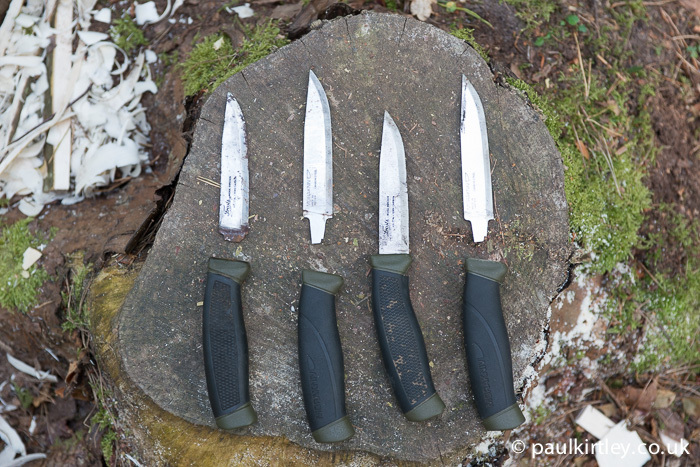 HOWEVER – looking at the practical aspect – Mors Kochanski – the wilderness survivalist who I am sure you have met – uses MORA exclusively. I have been on courses with him where he ruffs up the knife thoroughly – constructing shelters, carving, opening cans, batoning wood, cutting down trees, sharpening on river stones etc. etc. for weeks on end. If anybody was going to break a Mora knife- it would be Mors. Yet, he has never mentioned breaking a Mora in any situation. Nor does he mention any limitations on the use of the MORA. Rather, after some 40 years, he STILL promotes the MORA as the best bush-craft knife value available – for the price. Yes, I am fully aware of Mors’s preference for Mora knives. Moreover, we issue them exclusively on our courses. I’ve given hundreds of these knives out to people over recent years. But I have seen a small percentage of them break, in the hands of relative novices, undertaking tasks which are not unreasonable for a bushcraft knife. I too have broken several. It’s almost always batoning which breaks them. Check out the photo below. Here’s a few examples from the collection of broken Moras I keep…. For me, a Mora clipper/companion is not strong enough to be 100% reliable as a wilderness knife when resupply is not an option. To paraphrase Murphy : If it is possible for something to break – someone will find a way to break it!! Usually at the most inopportune time. Keep up the good work… !! Thanks Don. The Moras are good but they have limits. Paul I was hoping your first episode would answer a question which I have asked more than once, which is about the legal position when out in a public place in possession of a knife. As you will know there are strict laws concerning carrying a “bladed article” and I would appreciate your guidance on this issue. For example if I was out practising bushcraft on my own, in no official capacity, would that be sufficient lawful excuse for being in possession of a knife? Hi Paul.Excellent part 1,looking forward to more information and guidance. I thank the new informacion.Please tell something about the knife handles, which are better: high-quality wood, plastic or some other material. Wanted to know more about the backpacks: material, size, etc. Fantastic idea Paul, it works really well and the way you have presented it makes it very smooth. I like the use of another voice asking the questions, gives a clear divide between the two and also adds to the overall high editing quality we have come to expect from you. The intro montage was also very well done. Everyone loves a good montage! It’s great to hear questions that others have asked, this I am sure will become even more interesting when questions come forward that many may not have thought to ask in the first place. This could really be quite something, opening up thought processes and all that. Looking forward to the next release from the Paul Kirtley Studios. that we camped,a few of my mentors were born in the 1800’s. this world is too beautiful to stay inside! If you are ever in DEEP East Texas you would be welcome at our fire! If you do a future feature on ropes, please feel free to mail me directly as I have access to a proper expert on ropes who also likes bushcraft, bow making and has started hijacking the bbq to make knives, he is even more geeky than you. Thanks again, the whole family can now enjoy your expertise. just watched your episode 1 of of #AskPaulKirtley and it is fantastic. With that I can really well appreciate your answers people post you. Thanks for the feedback on episode 1 of #AskPaulKirtley. 06. Wow! Thanks so much for your work. It’s a pleasue to simply look at your word bank for all these word choices. This will inspire so many writers, young and old and those who strive to be great teachers.